Welcome to Clevedon Osteopathic Practice, we provide a dedicated Osteopathic healthcare service for the Clevedon and North Somerset area. 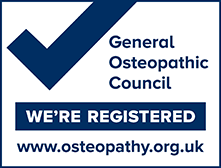 Established by husband and wife team James and Amy Horwood who both graduated from the British School of Osteopathy and are fully registered with the General Osteopathic Council and Institute of Osteopathy. To view our full list of treatments that we offer, please click here. Osteopathy is a system of healthcare that aims to diagnose the cause of your pain and dysfunction and work with hands on treatment to improve your condition. We are centrally located in Clevedon at 110 Old Church Road, Clevedon, North Somerset, BS21 6PT There is ample free parking on site or very close by.